Census figures from 2001* paint a stark picture – 83% of those cycling to work as their main mode of transport are male, and just 17% are female. This drops as low as 9% in West Belfast. Usually Belfast commuter cycling differs greatly from the rest of Northern Ireland. Where a 60% increase in Belfast cyclists occurred in the 10 years to 2011, the rest of Northern Ireland (excluding Belfast) saw a 12% drop. The headline rate for all commuting is currently between 2.1-4% in Belfast, and just 0.8-1% in the rest of NI. Belfast stands apart with a strong developing urban cycling culture. Yet, along gender lines, the 83% male 17% female rates are exactly the same for city and province. In the cities and countries with the highest levels of cycling around the world, there is near parity between the genders. Cycling is catered for and respected as a transport mode in very different ways to Belfast. But what else can the Census tell us about the gender imbalance in Belfast and NI? 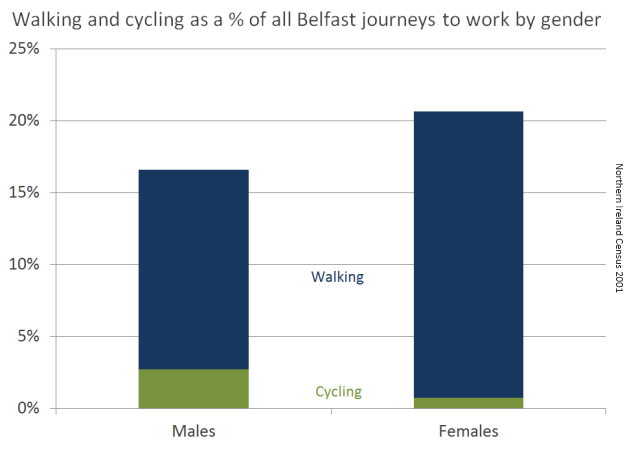 We can examine Census data to test some factors which may influence travel choices, possibly causing this imbalance by making cycling less attractive to women in Belfast. Are women travelling further to work than men? Is the physical activity a major drawback? How does age influence choice of active travel? 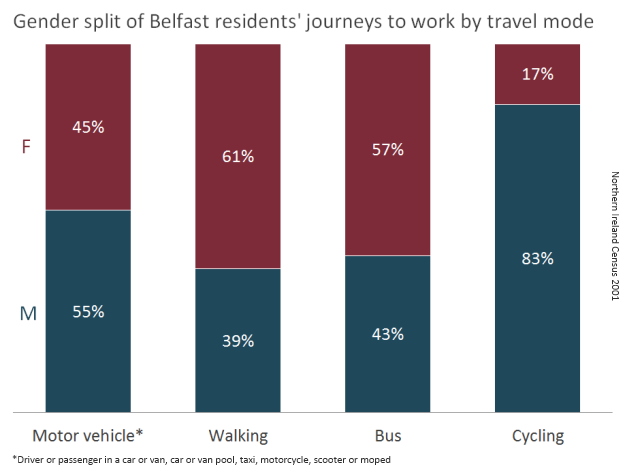 Comparing cycling to the other main forms of commuter transport in Belfast shows cycling is uniquely out of balance. One factor at work in 2001 was that 80% of men held a driving licence against just 60% of women. In the last ten years this gap has narrowed with 68% of women now owning a licence – perhaps an early indicator that a narrowing of the cycling gap is unlikely. Is Belfast itself a factor? But what affect does any of this have on the gender split? 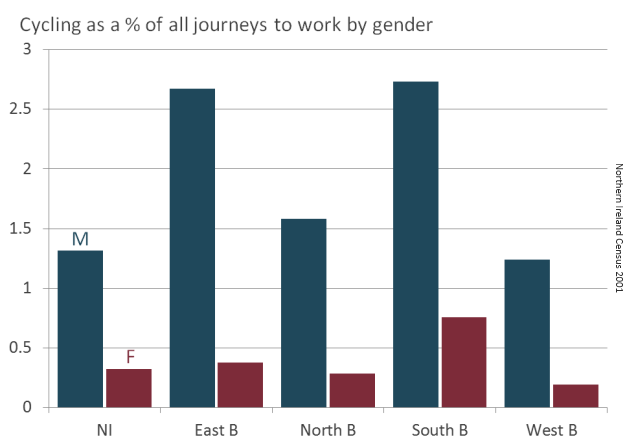 The first striking point is there is little difference between female commuter cycling levels in Belfast and NI, except in the south of the city. East and South Belfast are the main centres for male cycling (in the city and the whole of NI) but West Belfast is actually below the NI average for both men and women, which is very surprising for an urban area. Does travel distance holds back commuter cycling in Belfast, especially in the North and West? Do women have further to travel than men, making cycling less attractive? Not according to the Census. In fact, the percentage of women living within 5km/3miles of their workplace is significantly higher than men, in all areas of the city. Broadly speaking around 2/3 of women travel 3 miles or less to work against just half of men, putting a larger section of the female working population within a very reasonable cycling journey. As discussed in previous posts, Belfast is a relatively small city, with most of the traditional suburb-centre commuter journeys for residents lying within a 3 mile radius of City Hall. With 75% of residents also working with Belfast Council area, the distance argument against cycling holds little weight. Is it the physical activity that’s putting more women in Belfast off cycling than men? Again the Census doesn’t support this idea, if we compare cycling to work with walking. We’ve already seen that women account for 61% of all walking journeys to work. Combining the two ‘physical activity’ modes it’s clear there are more active commuting women than men, but cycling levels are out of step with the overall picture. 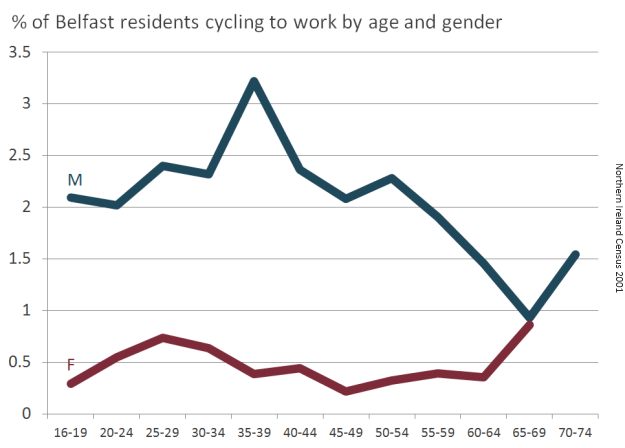 It’s interesting to look at age as a factor in active commuting between genders. Female cycling remains at a very low level through all age groups, with the major dip approaching middle age. Looking at men, there is a very interesting and pronounced spike approaching middle age – has the lesser spotted Mamil (middle-aged man in lycra) been identified? Comparing cycling age groups with walking shows another clear difference. The early decline for women halts in the early 30s, and then walking to work grows strongly into pensionable age. 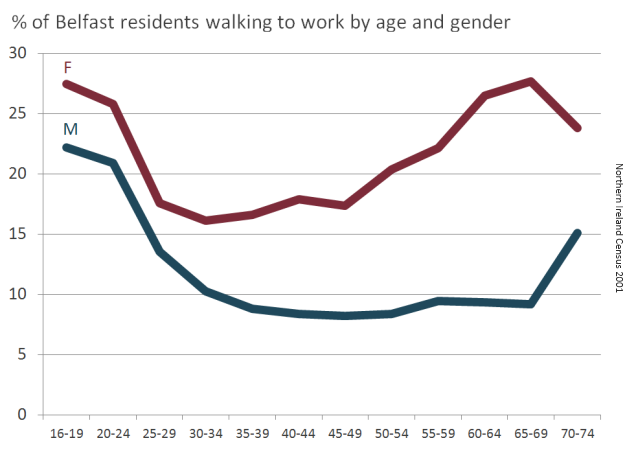 The male % of commuting on foot remains quite suppressed from the mid 30s onwards. 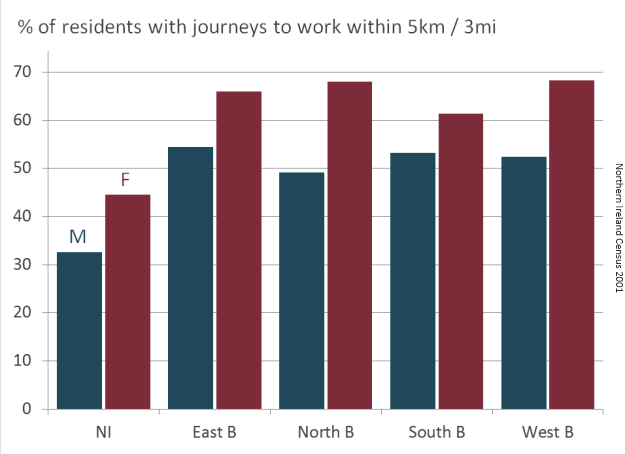 Looking at these very narrow factors of proximity to workplaces and propensity to active commuting suggests that commuter cycling could be a more straightforward mode for more women than men in Belfast. So something else must be at work here. Bicycle ownership as a barrier? Another possible underlying issue is the low levels of bicycle ownership in Northern Ireland. The Northern Ireland Travel Survey traces bike ownership by household in Northern Ireland. Looking back over the last 10 years, the percentages have remained almost completely unchanged. Almost 2/3 of households don’t own any bikes, obviously a fairly fundamental barrier to cycling. Contrast this with the Netherlands, where there are more bikes than people. In 2009-11 15% of households owned one bike, and with the commuter cycling gender levels it’s not a massive leap to imagine men dominate this category. Just 1/4 of households have 2 bikes or more, meaning that a massive section of the population, especially where families and couples are concerned, are not able to cycle together – making everyday cycling less inclusive, social, attractive or likely. What are the real underlying issues? Belfast’s low female cycling levels are clear, and seems counter-intuitive against the limited factors highlighted above. 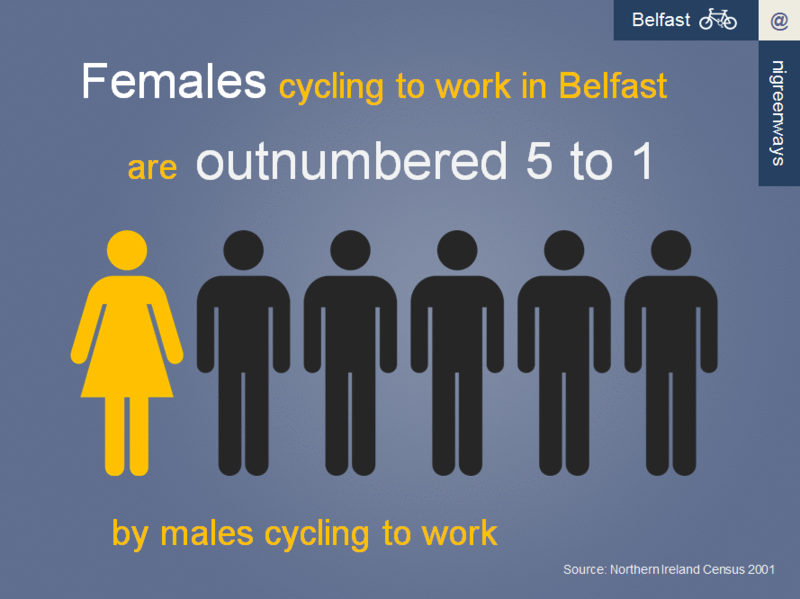 So what’s really holding women back from cycling in higher numbers Belfast? Determining the answers for Belfast is beyond the scope of this post, but research from around the world is freely available to search and digest. Hopefully this post can begin a discussion about looking at Belfast in more detail. Both men and women struggle with these issues, but women appeared to be more sensitive to concerns, while men tended to display more cavalier attitudes especially to interacting with traffic. Problems with image are particularly interesting in a city like Belfast, where such low cycling levels mean it’s a firmly niche activity, and negative stereotypes remain attached. For a city as small as Belfast where a large percentage of commuter journeys are within 3 miles, concerns about arriving to work in a sweaty mess seem misplaced. Certainly where people feel the need to pedal as quick as possible to survive in a harsh traffic environment, this can be a problem. But this is again the effect of road environment and lack of safe cycle space provision. The obsession with shower facilities at work as a barrier to mass cycling, and to women cycling in greater numbers, is probably an irrelevant diversion in Belfast, if the street conditions were right. It’s interesting to look at South Belfast where women accounted for 21% of commuter cyclists. The traffic-free route running from the towpath to the only (in 2001) on-road separated cycle lane in Belfast on the Stranmillis Embankment, and to the Laganside pathways is likely to be a major factor in this minor success. In a sense, image and safety are rolled together in places like the Netherlands. Safe routes, separated when required for safety, means the cycling culture has developed to the point where the ‘florescent clothing with helmet’ image is redundant. Cities with high levels of cycling are more high-fashion than hi-viz, and the culture of cycling is mainstream rather than niche. Everyone cycles – we certainly can’t say that in Belfast. The typical Belfast commuter cyclist image? All of this also shows the limitation of just looking at commuter cycling, although it’s the most detailed ‘free’ source of data available due to the Census. If cycling is seen as limited to just getting to work, or just going for a leisure ride at the weekend, ‘mass’ cycling is unlikely to develop. Seeing cycling as a realistic alternative to other transport modes for all types of activities – the school run, shopping, social trips, any short journey – requires it to be practical and safe, and this is clearly not the case. A recent survey in Belfast showed that 60% of people felt the roads were too dangerous for cycling. Steps like Conall McDevitt’s 20mph Private Member’s Bill are to be welcomed as beginning to make our streets, and parts of potential cycling journeys, safer for everyone. We do seem to be heading slowly in the right direction. Facilities like the Lagan and Lough route, the more recent Comber Greenway and the developing Connswater Greenway are superb. But that’s for the small % of Belfast residents who live nearby and have journeys which can incorporate these routes without major diversions. A truly transformative step would be to begin addressing poor safety perception on the main arterial routes, where the vast bulk of journeys, commuting or otherwise, are focused. Providing truly safe cycling space with attractive and direct routes would encourage more men and women, young and old, to cycle our city. Perhaps the only realistic way to rebalance male and female cycling is for the Department for Regional Development to acknowledge and take ‘ownership’ of the disparity. Forming an action plan with targets to close the gender gap would require some radical thinking about how we provide safe road space for all users.